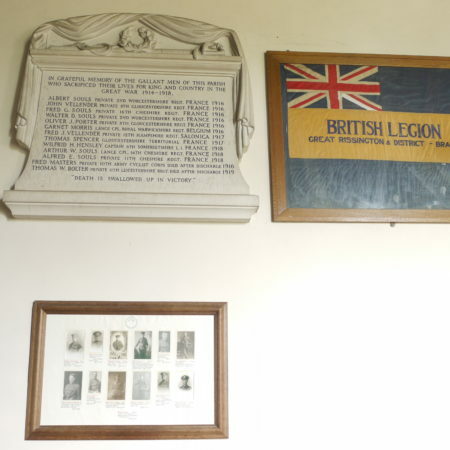 War memorials are not, of course, church monuments. But in the broader context of commemoration they have similarities of style and function. They provide a focus for acts of remembrance and prompt prayers for the dead. In some places the names of the fallen are read out annually on Remembrance Sunday, echoing as Sir Tony Baldry noted in his article in Church Monuments 2013 the medieval practice of reciting the obit roll. 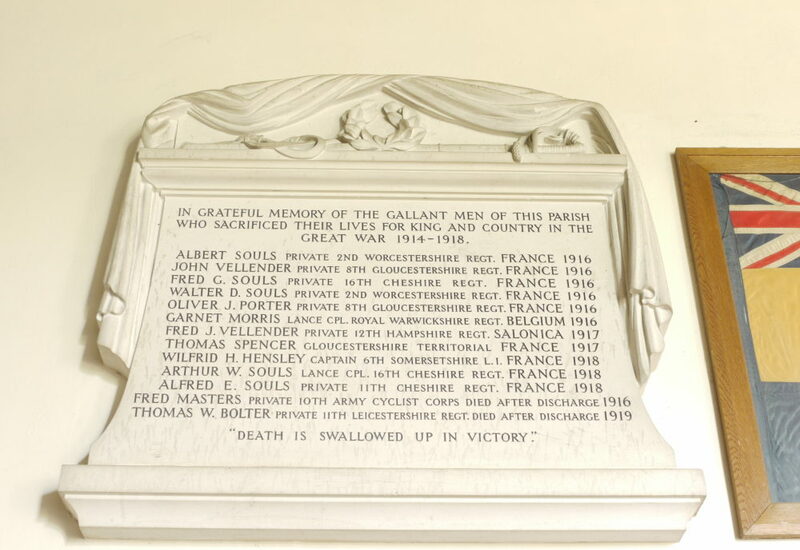 This memorial in the church at Great Rissington (Gloucestershire) tells a particularly poignant story. 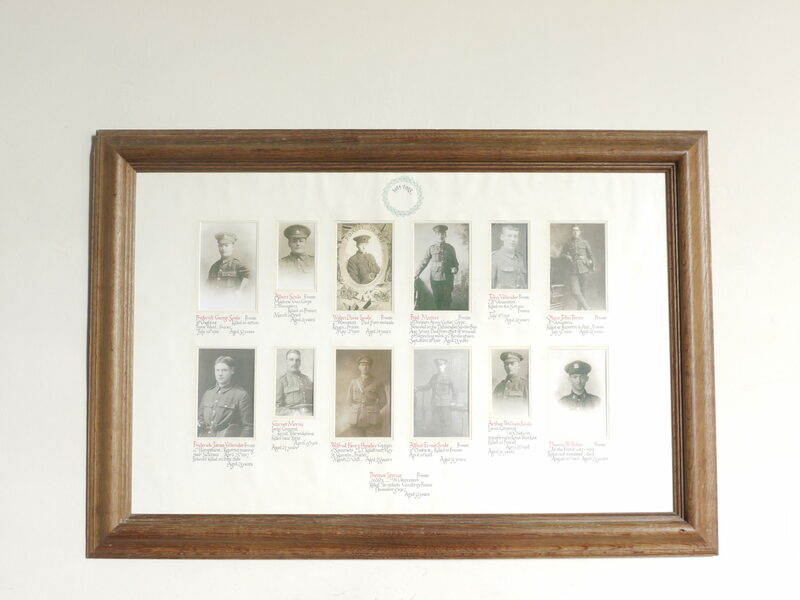 Five brothers of the Souls family were among the thirteen sons of the village killed in the First World War (including two who died from their wounds after being invalided out). Three Souls died in 1916, two in 1918. They served in various regiments; four were privates and one a lance-corporal. 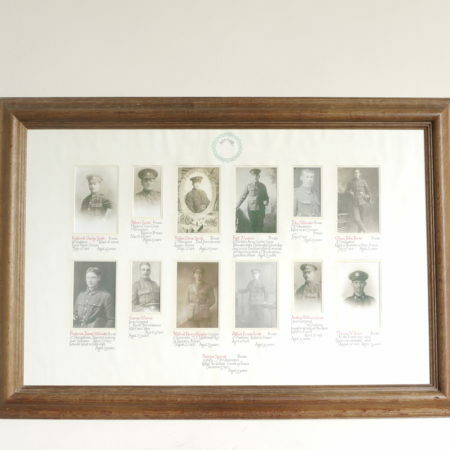 Photographs of them are displayed near the memorial tablet and captions give their ages and information about how they died, or in one case was listed as missing in action. Their mother is said to have kept a candle burning in a window in the vain hope that he would one day return alive; the memorial has no compunction in including him among those killed. The brothers were aged from 21 to 32 at time of death, the three older brothers having enlisted in the 16th Cheshires, one of the so-called ‘bantam’ regiments formed for those fit and willing to fight but too short to meet the army’s height requirement. Two of this trio were twins aged 31 and they were the ones who died in 1918. Maybe this final cruelty of fate as the war was coming to its end prompted their mother’s bitter reaction: she is said to have blamed the King for her loss and ever after refused to stand for the national anthem. The loss of five American brothers from one family in 1942 prompted President Roosevelt to pledge that in future no family should lose more than two sons. Hence the real-life rescue of a missing third son which inspired the film ‘Saving Private Ryan’. 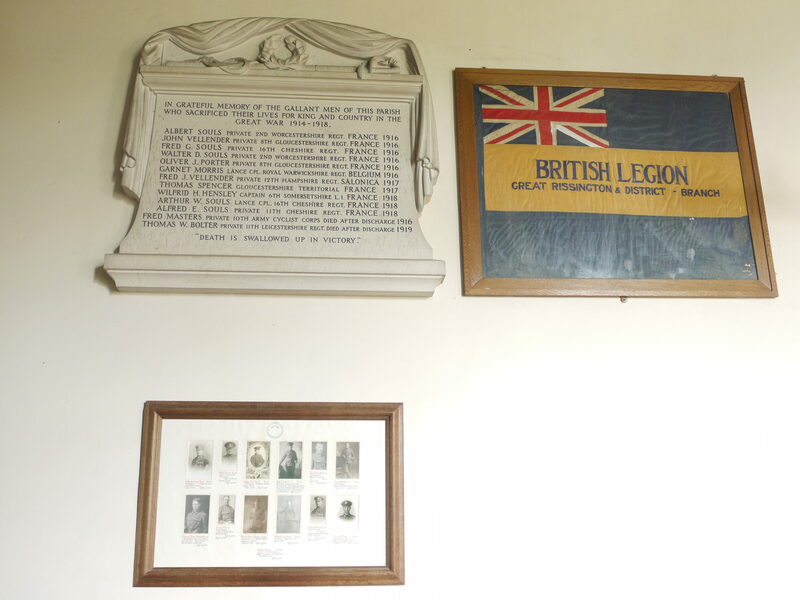 As the Great Rissington memorial reminds us, there was no room for such humane concessions in WW I and the shilling a week pension for each dead son was no compensation for poor Mrs Souls.